Home » Bombo Radyo Philippines , Ginebra San Miguel , Manila Broadcasting Company , Milyun-Milyung Ganado , promo , Radio Station , raffle , win » Join "Ginebra San Miguel Milyun-Milyung Ganado Raffle Promo"
Join "Ginebra San Miguel Milyun-Milyung Ganado Raffle Promo"
Ginebra San Miguel Inc. (GSMI) the company the makers of a gin that is patronage by everyone in all walks of life, Ginebra San Miguel, recently launched a nationwide raffle promo that will give consumers a chance to win up to 1M pesos. 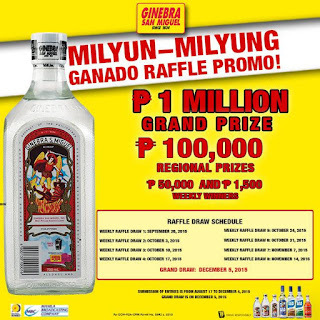 "Ginebra San Miguel Milyun-Milyung Ganado Raffle Promo" will be giving away cash prizes in a weekly, monthly, regional and national grand draw starting September 26, 2015. All you have to do is to purchase any Ginebra San Miguel products and write on the piece of paper your 1. Complete Name 2. Age 3. Complete Address 4.Contact Number/s and Signature. Enclose entries in a white, legal-sized envelope along with any of the proof of purchase: 3 seals of any variant of Ginebra San Miguel (Round,Frasco, Frasquito, Angelito), 3 seals of Vino Kulafu Classic or 1 cap of GSM Blue of GSM Blue Flavors. Write on the envelop the 1. Proof-of-Purchase used 2. Radio Station and the promo name 3. 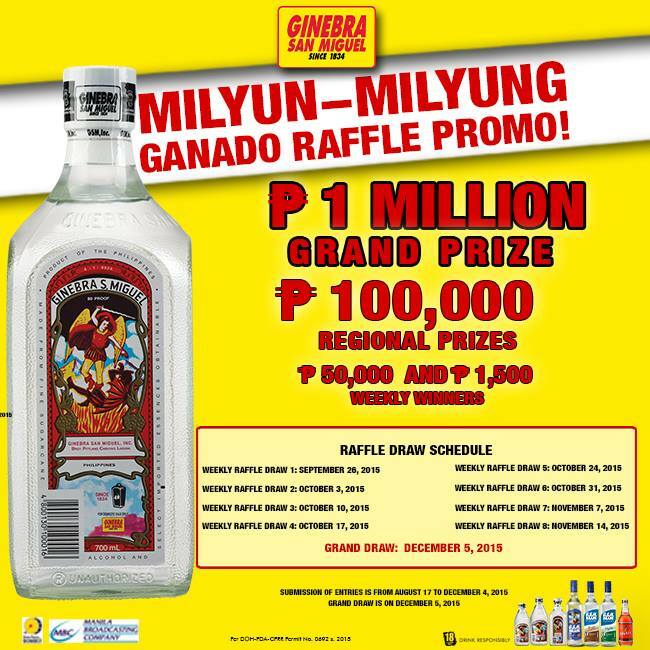 "Ginebra San Miguel Milyun-Milyung Ganado Caps and Selyo Raffle Promo". Since this promo is in partnership with Philippines' leading radio networks Manila Broadcasting Company (MBC) and Bombo Radyo Philippines (Bombo), you may mail or drop your entries to the "Ginebra San Miguel Milyun-Milyung Ganado Caps and Selyo Raffle Promo" c/o MBC or Bombo Radyo along with the name and address of the radio station (90.7 Love Radio at MBC Building, Sotto St.CCP Complex, Roxas Boulevard, Pasay City) where drop boxes are also located. 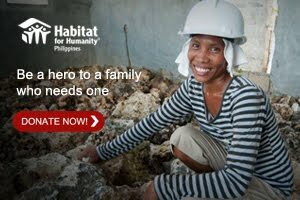 The deadline of the weekly draw is every Friday before 5PM and the deadline for the grand draw for a chance to win 1M pesos is December 4 Friday 5PM. 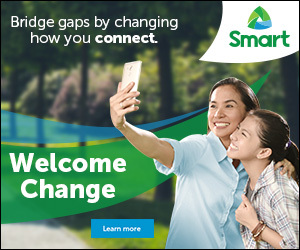 For the weekly prizes three (3) will win 1,500Php each and a 50, 000Php per region meaning Metro Manila, North Luzon, South Luzon, Visayas and Mindanao. For the Radio Natin the monthly prize is 100,000Php and for the grand draw one winner of 100,000Php per Region and a whooping 1M for one lucky Ginebra San Miguel consumers. For more details, you may follow Ginebra San Miguel's Facebook/barangayginebra page and visit www.ginebrasanmiguel.com.